Picadillo, or spiced ground meat as its more simply known, is a dish that usually appears in Cuban cuisine. There are many different ways to make Picadillo but its usually made with either beef or pork mince. I’ve used pork mince here as I had it in the freezer. 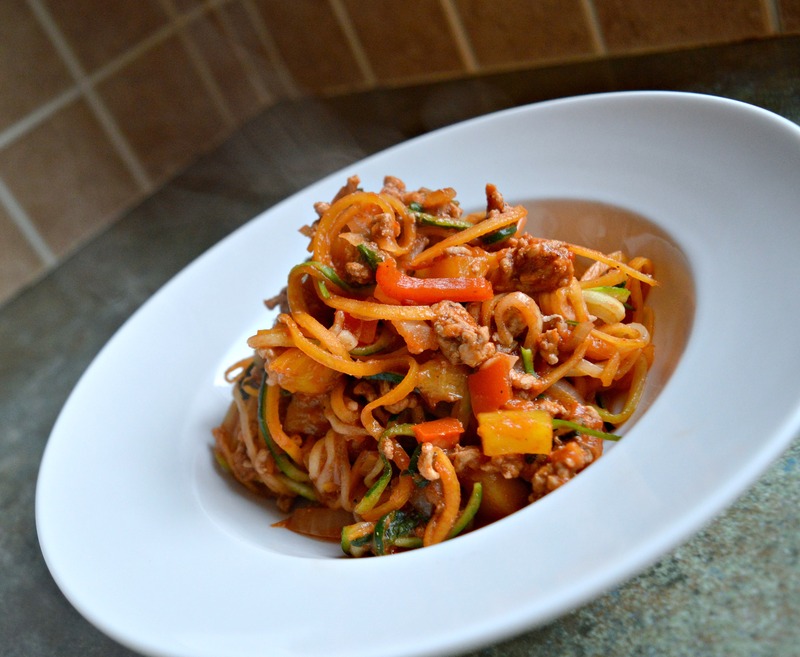 This is a great dish as its really quick and easy to cook up and the end result is bursting with flavour. You can serve this with whatever you fancy. I did my other halfs on a bed of basmati rice (60g – so the whole dish was 11sp in total) and I served mine tossed through spiralised courgette and butternut squash so the whole dish was only 5sp. Both were topped with a tablespoon of half fat sour cream (1sp) and a final sprinkle of coriander. If you are only making this for two I would make the whole lot and either have it two nights in a row, or you can have it for lunch the next day. Take a large frying pan, spray with 1kal and bring to a medium heat. Add the mince to the pan and fry, breaking up into small chunks as its cooking. After five minutes add the onion, pepper, garlic and spices and fry until the onions are soft and the pork mince is cooked through (around another five minutes). Next add the tomato puree and salsa, fill the jar up with water and add half the water. Stir through and reduce the heat to low. Add the mango and simmer for around 15 minutes until the flavours combine nicely. Keep adding the water bit by bit until the sauce is the sauciness you like. Turn off the heat and add the lime juice and fresh coriander. Give a final stir. Serve with the accompaniment of your choice. My other half had his with basmati rice and I had mine with spiralised butternut squash and courgette. Both were topped with a tablespoon of half fat sour cream and a final sprinkle of coriander. 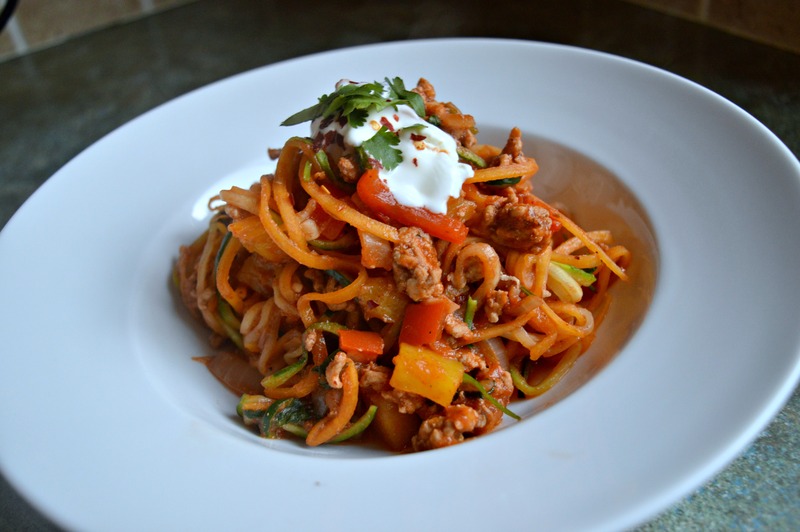 If you are having yours with courgette, spiralize the courgette (you will need one per person). Then pop into the frying pan with your portion of picadillo and stir fry for a few minutes on a high heat. 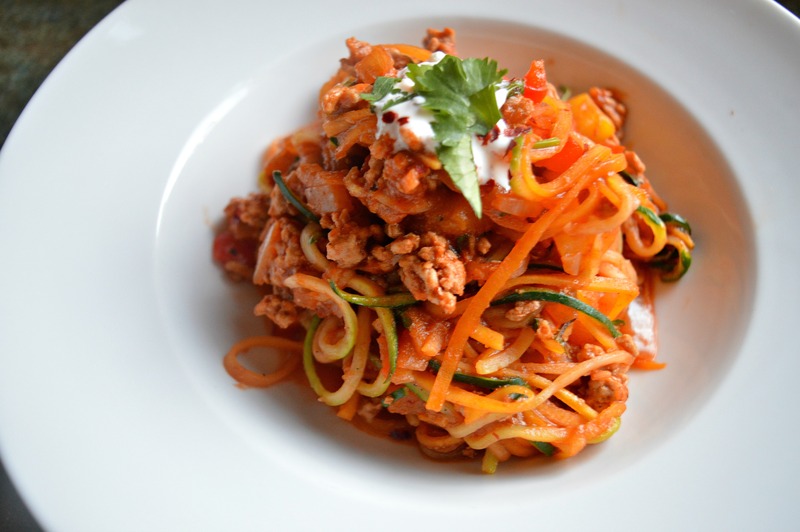 If you are having it with spiralised butternut squash, spiralise, then microwave for two minutes. Then stir fry with sauce.